A financial power of attorney gives an agent wide authority to control your financial assets. It can be a helpful legal tool if you will be unable to oversee particular transactions, for example, because you will be away on vacation, or because you have to devote time to more important matters. 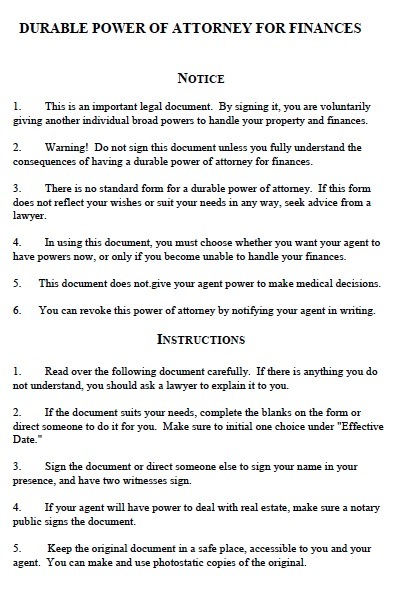 This document gives the agent tremendous authority over your finances, so it is critical only to select someone you trust to act as your agent. You should also pick someone who understands your business needs, and you should regularly oversee the agent’s performance and discuss it with him or her. You can also use a limited power of attorney if you only need someone to carry out one or a few transactions for you, which can be convenient if you need someone to oversee your business only for a short period. In Michigan, two witnesses must sign the form or it must be notarized for the form to be valid. A recent Michigan law also requires agents to sign an acknowledgement of their duties for the form to be valid, including duties to act honestly and in the principal’s best interests.